"It was a global war, fought on land, sea and air. claiming four empires and over ten million lives." I'm always a little apprehensive anytime something is referred to as "the complete" anything, and past experience has shown me that when the subject is as broad and far flung as something like World War I, containing all the intricacies in just over six hours is not only unlikely, but wildly improbable. 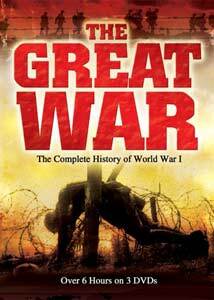 That's what is thematically postulated with The Great War: The Complete History of World War I, a three-disc set from Koch Vision that purports to chronicle the sprawling horrors of a global conflict in eight 43-minute episodes. That's a pretty tall order, and maybe I'm just fixating on that whole "complete" aspect a little too much, because this British-made series is certainly packed to the rafters with all manner of archival footage from the time period that�in and of itself�is fascinating to look at. And in fairness, there is history here too, but it is this historical content that never reaches what I could have considered the "complete" stage, ending up more or less rudimentary in its look at the progression of events from 1914 to 1918. The material probably won't offer anything new to schooled war buffs, nor will it answer all the possible questions for those new to the subject, which is what something touted as "complete" ought to be able to do. At the outset there's mention of how the "political rancor and racial hatred" left over at the war's end was just a placeholder for the inevitable bloodshed of WW II, and that's a pretty grim, yet realistic statement that makes the scope of this first war to end all wars so depressingly futile. And the presentation, which centers on one year per episode for the first five installments (with the final three looking at different categories of warfare technology), tries to cram in a lot of information, but some of it seems like superfluous and unnecessary detail, and other, more essential elements get passed over, with the narration failing to answer certain key questions. Aside from the year-by-year eps gloss over when they should have been detailed (and vice-versa), the three segments that close out the series, looking at land, air, and sea technology provide a better structured and more comprehensive look at things like the advent of machine guns and submarines. It's a good way to round out this set, where the specific subjects can be more easily handled within the constructs of a forty-three minute program than say, the entire events of the year 1915. Image Transfer Review: The eight episodes have been issued in their original 1.33:1 fullframe aspect ratio, and if one takes into account the content is made up of 90-year-old archival footage, the material looks good, all things considered. There are some understandable quality issues, and clarity and detail varies quite a bit, but the presentation falls within an acceptable range given the age. Audio Transfer Review: Audio comes in one flavor, and it's a standard 2.0 stereo track that is clear, but far from memorable. Voice quality is adequate; a bit soft, though still understandable at all times. Extras Review: The packaging is three clear thinpak cases inside of a cardboard slipcase that features a grim photo of a dead soldier sprawled across a barbed-wire fence. No extras to speak of, save a few Koch Vision trailers, with each individual episode cut into ten chapters. The good news is there is over six hours of content on World War I; the bad news is that it never provides the "complete" narrative that it should. Fascinating footage, but the content is slightly cursory where greater depth would have been welcome. Take off the word "complete" and I'm likely to have been far less critical.